People always talk about games ... So, let's now take a few minutes to review a bunch of great accessories for our good old Neo Geo! Which ones are essential, which ones are rare, which arcade stick is the best among all existing models? Let's take a tour! 1st generation stick and its box. Released with the very first machine in 1990, and consistently packed with Neo Geo systems*, SNK sticks -oftenly called 'square' controllers- are the most famous ones among AES players. Rectangular, with a flat and clean design (front, it looks like a manta ray), this model offers a near-perfect handling. Famous for its robustness and highly prized by arcade players, it has only qualities: hyper accurate joystick (very short courses) with clicking directions, solid buttons, light base mounted on anti-slip skids... and that's it! The only downside is the cable length, which is 1.30 meters only. Its simplicity is the key of its robustness and efficiency. A real benchmark among all sticks, in a word: the perfect grip. 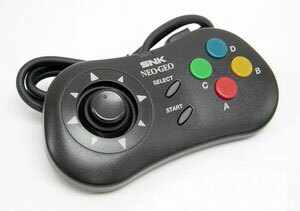 More commonly called "Bean" stick, this model was sold separately of the Neo Geo CD when it was released in 1994. Slightly smaller than its predecessor, its particular bean form made this model very original. Generally pretty less prized than the famous "square" stick by a vast majority of players, it still packs similar qualities. Slightly bigger buttons, some anti-slip surface for the right hand, more solid stick... If handling looks close to that of the first generation sticks, it is in fact not as good at all and the quality of its buttons is a notch below. Only paddle available for the Neo Geo, the "Neo Geo CD Controller", comes with the CD system upon its release, which might have delighted fans of pads frustrated with the Neo Geo controllers! With its directional pad, its four buttons arranged in lozenge form, and its small size, it looks like the ideal companion for platforms games ! It's a good quality product, with a quite successful design and a cable slightly longer than those of sticks. Here's the Holy Grail of any Neo Geo collector - provided it focuses a little on accessories - as it's pretty difficult to find it boxed, in good condition. Rarely seen on auction sites or even in videogames shops, this incredible thing was designed for use on very special Mahjong games available on the Neo Geo (4/5 games, Japanese language only). Resurfacing only from times to times in certain shops, its price is often very high. It is a size slightly larger than the first-generation stick, and its buttons are appropriate and of good quality. The cable is as short as the first SNK sticks and quality of manufacturing is also excellent. Regarded by many as a serious contender for the official square SNK stick, the Hori Fighting Stick Neo is pretty nice arcade stick. 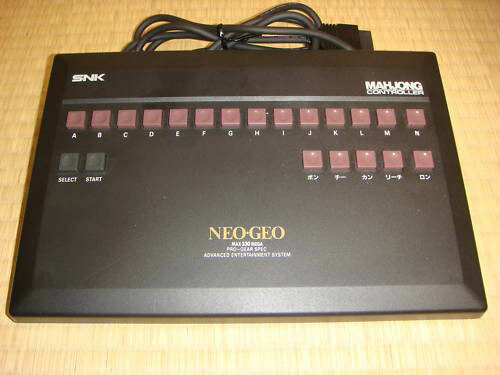 Manufactured by the world's number 1 firm for arcade controllers at the time, this model, although heavier than its rival comming from SNK, offers a similar gaming quality. The joystick directions have slightly longer courses, but the buttons are a little better, as well as the overall quality. Plus, it features the turbo function for each button... Neo Geo players should definetely give it a try, at least for those who don't know it! Hori Fighting Stick Neo II: he's back! 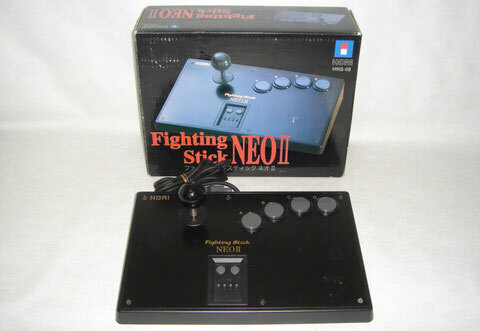 Identical to the Hori Fighting Stick in design, this Neo II version offers a better gameboard, better buttons and a directional stick closer to the SNK stick. Offering the same turbo features as its predecessor , this jewel looks like an "update" of the Hori previous hardware.